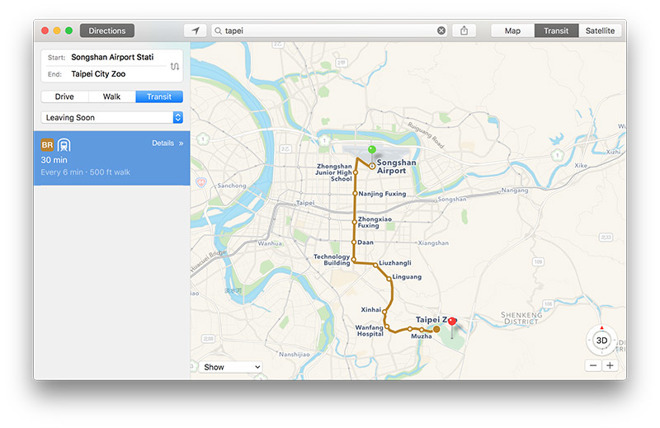 Now live in Maps for iOS and macOS, Transit integration for Taiwan allows users in the area to plan trips using a number of public transportation options, from local shuttles to high speed rail. The entire island appears to be covered, from Taipei to Kaohsiung to Hualien, with information provided from major services including the Taipei Metro, Taiwan High Speed Rail and local Taiwan Railway. Access to local bus routes and tourist shuttles is provided for larger cities, as is information for ferries like the Tungliu Ferry and Green Island Star. Apple Maps is also showing travel advisories in certain areas. For example, the Kuo Kuang Bus in Puli Township is showing a schedule change to account for the Mid-Autumn Festival and Double Tenth Day holidays. It appears Apple is pulling data for each transit service from first-party sources, a common strategy used in other populous locales around the world. Apple Maps Transit is Apple's in-house replacement for transit directions initially provided through a partnership with Google. The company removed transit assets in iOS 6 when it dropped system-level Google Maps integration. Transit data returned in iOS 9 powered by technology acquired through purchases like HopStop and Embark. Like its competitors, Transit in Apple Maps provides routes, departure times and other relevant data for buses, trains, ferries and other forms of public transportation. Unique to the service are top-down views of underground subway and train stations, though the feature is currently limited to a handful of high population locations. Apple has slowly expanded Transit coverage since its unveiling in 2015. Earlier this year, the company activated transit directions in Paris, Singapore, the Netherlands, Adelaide, Australia and Madrid, Spain. Most recently, Apple greatly expanded coverage in Australia, while at the same time tipping future integration for Ireland.